France Carte des Chemin de Fer. 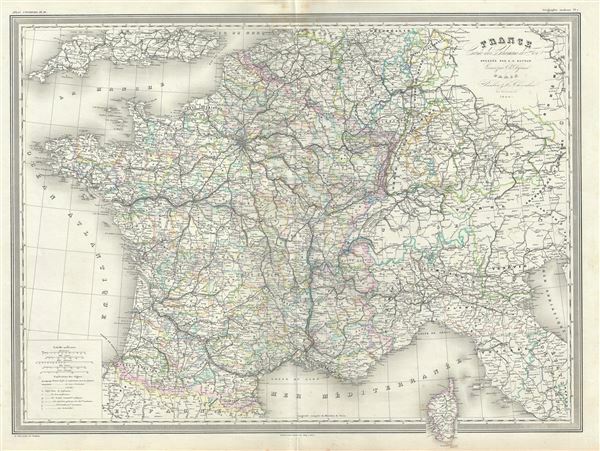 This is an uncommon 1860 elephant folio railway map of France by A. H. Dufour. It covers the whole of France including parts of Italy, Germany and Switzerland, depicting the railway system throughout France. Includes Corsica. Throughout, the map notes cities, towns, rivers, important stations, military posts and an assortment of additional topographical features. This map was prepared by Auguste-Henri Dufour and engraved by Charles Dyonette for publication plate no. 16 in Armand Le Chevalier's 1860 edition of Atlas Universel, Physique, Historique et Politique de Geographie Ancienne et Moderne.